The pegs board game is one of the more popular strategy games that are available online. This game is structurally similar to checkers but in terms of strategy, is more like chess, as it is focused on testing the IQ of the players, the pegs board game is also known as the IQ test. While it appears that this is a fairly straight forward game, the trick is in mastering how the game should be played in order to optimize the points that can be scored and this will require the use of sometimes complicated strategies and ultimately to have the minimal amounts of pegs on the board as possible. There are 15 holes on the triangular board and 14 of these are to be filled with pegs. Jump pegs over each other to reach the unoccupied slot. However you can only jump one peg in a straight line, or down or diagonally. Once this is done, remove the peg that was jumped over. This will result in there now being two holes on the board that need to be filled. You will need to keep jumping over pegs, and remove the pegs jumped over until there are no more moves that can be taken. The rule is that the less pegs you have on the board, the better the score. In theory and according to some players, it is possible to leave only one peg on the board at the final outcome and if you are able to achieve this, it is a sign of true genius! It is possible to play this game on your own and in this regard, it is similar to Solitaire. Apparently the pegs board game has been around since about 1697 and was commonly played in the royal court by aristocrats. There are many pieces of renaissance art that show people playing this game which was considered to be an extremely fashionable past-time. These pegs board games actually come with boards of various shapes and the most popular is the triangular shaped boards as these allow players to move the pegs in all three directions. 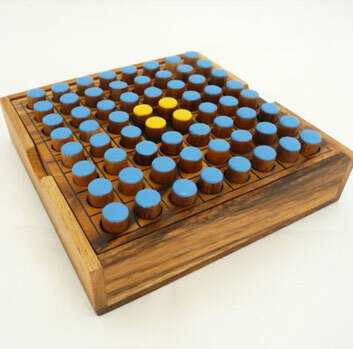 There are also cross-shaped boards as well as square boards but the more complicated the board and the greater the number of pegs that can be used, the more complex the game. The minimum number of holes on the board should be 15 although it can go as high as double that amount. The pegs board game requires strategy and a common mistake is to reach a point where there are two or three widely spaced pegs and this means that it will not be possible to jump over any peg and consequently the game may come to a halt. Therefore when playing this game, remember to keep the pegs closely together and to avoid the creation of wide spaces, otherwise it will quickly become impossible to continue playing.